Throw all of your ingredients in a heavy sauce pan, the heavier the better. You are cooking sugar here. Throw your temp onto medium-high and mash and stir with a potato masher. Bring to boil and continue to stir and mash until your jam mixture reaches 220 degrees F. Pour into clean sterilized jars. At this point you can either process or place jar in the refrigerator to be eaten right away. I chose the later, it is good stuff and goes fast in my house. It’s is yummy on toast, biscuits, peanut butter and jelly’s, pancakes..etc. I think you get my point. 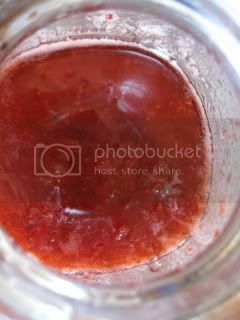 The best part though is that it is easy and you know EXACTLY what is in your jam, no added ingredients or artificial colors. It is simple goodness for you and your family that you can feel good about.